The city of Slochteren, situated in the north of the Netherlands, is well known for its gas winning activities. 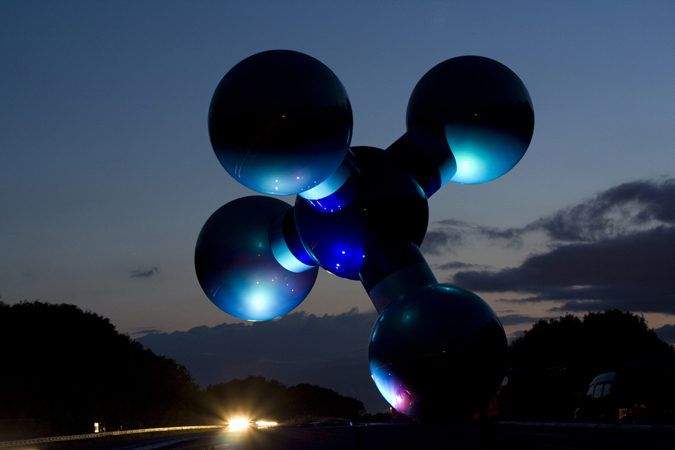 In honour of the fiftieth jubilee of the discovery of the first natural gas field in Slochteren a sculpture was designed by artist Marc Ruygrok. 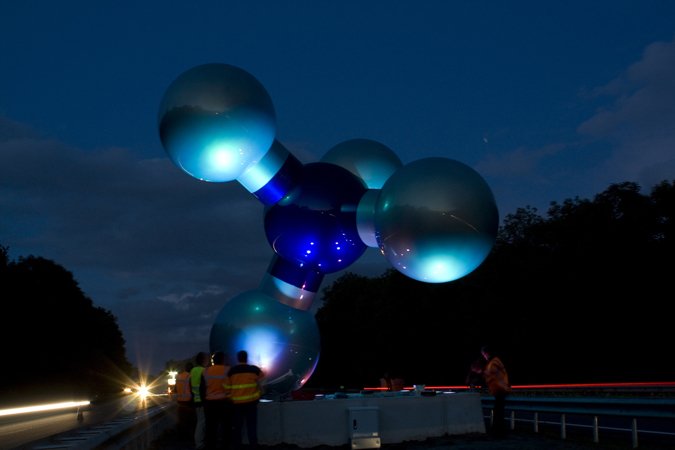 The 8 meter high sculpture is an enlarged methane molecule CH4, the main component of natural gas. The sculpture is placed between the highway lanes of the A7, near Slochteren. 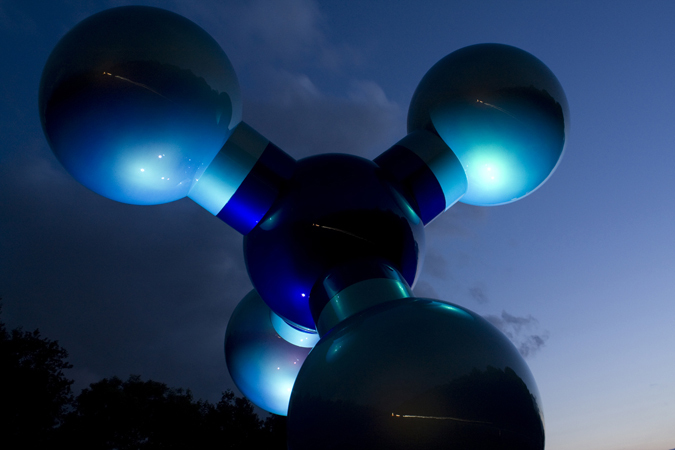 On the 16th of june 2009 “the Gas Molecule” was revealed by her majesty Queen Beatrix. The concept was to let the molecule float on air rising up from the ground. Challenges in the process of realisation were in the first place the height of 8m and the diameter of the hydrogen atom of 2m. The second challange was the location, the passing traffic on the highway was not to be distracted too much or blinded by the lighting of the molecule. The third challenge was the colour of the artpiece: a two tone paint also used for cars ‘azzuro nuvola’ (alfa romeo). This is an iridescent lacquer, which during the day changes color by reflecting the sky and surroundings. The concept idea was first tested on the sculpture and through simulation with a computer model. The tests were done as the artpiece was assembled in Berlin. The aim of the test was to determine the final positions, angles, optics of the inground fixtures and the right colour. The use of 6 cool white ceramic discharge metal halide lamps in combination with blue dichroic glass filters gives a vivid and sparkling lighting effect which seams to lifts up the molecule, as if it were rising up from the ground, lighter than air. De kunstenaar Marc Ruygrok heeft ter herinnering aan de eerste gasproductie in Slochteren, 50 jaar geleden een reusachtige gasmolecuul gemaakt die lijkt te zweven in de middenberm van de A7. Auto’s razen aan het beeld voorbij en benadrukken zo de vluchtigheid van gas. In het avondbeeld lijkt een gasvlam te zijn aangegaan. Zacht blauw licht schijnt de onderkant van de molecuul aan en geeft het beeld in het donker een nieuwe gedaante.